Welcome to the UK Radiation website. 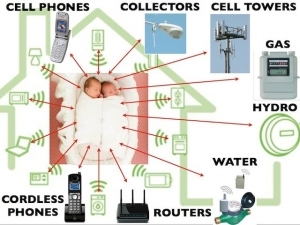 We are a non profit making organisation focusing on making people aware of the potential long term health effects and dangers of microwave radiation emitted from mobile and cordless phones, masts, smart meters and wireless technology in general. We can give advice on what you should be doing to ensure that by using the latest technologies you are not unduly exposing yourself and your family to any unnecessary risks. We can supply metering equipment to hire enabling you to monitor and test your own home for a very small rental fee over a week. In our experience most people are completely oblivious to the hidden risks they are taking by holding a mobile phone to their ear. Giving one to a child is like putting their heads inside a microwave oven. We put on seminars for businesses, the public in general, organisations and groups. Our aim is to educate with safe practice and we regularly demonstrate the issues using professional equipment to monitor the amount of radiation from a home DECT phone and a wireless router for example. Please use this website as a resource tool to study and learn more about the issues that we believe are contributing to the rise in health conditions all over the world. It is now an indisputable fact that everybody is affected by this invisible and silent pollution in one way or another. Because of proven adverse health effects we can successfully report that with our help three of our clients smart meters have been removed without any charge to them. There is no redress from the power companies as they know the potential risks of these devices on our well being. At the moment smart meters are optional but we wonder how long this will remain the case as the USA and Canada already have been paying an “opt out fee” for something they don’t want.